The sooth side o Cho Oyu frae Gokyo. 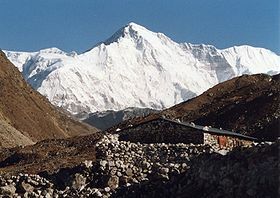 Cho Oyu (Nepali: चोयु; Tibetan: ཇོ་བོ་དབུ་ཡ, Wylie: jo bo dbu yag, ZYPY: Qowowuyag: Cheenese: 卓奧友山; pinyin: Zhuó'àoyǒu Shān) is the saxt heichest moontain in the warld at 8,201 metres (26,906 ft) abuin sea level. ↑ "China I: Tibet - Xizang". Peaklist.org. Retrieved 2014-05-29.